The inevitable reduced demand for tobacco threatens the future of millions of smallholder farmers who depend on the tobacco leaf for their livelihood. Most smallholder tobacco farmers live in low- and middle-income countries and currently have no viable alternative income sources. Countries that are most dependent on tobacco for exports, such as Malawi, tend to be among the poorest countries in the world and have high prevalence of childhood malnutrition. The goal of the Foundation for a Smoke-Free World, established in 2017, is to help these farmers transition away from tobacco toward innovative, economically viable, and sustainable alternative livelihoods. The Foundation launched its Agricultural Transformation Initiative (ATI) to support efforts to diversify tobacco-dominated economies and lessen their reliance on the tobacco sector, focusing first on populations and countries with the greatest need for economic transformation and growth. The prevalence of smoking among male adults has globally and steadily declined from 44.2% in 2000 to 34.6% in 2016. However, cigarette sales continued to rise, peaking at 6.46 trillion cigarettes sold in 2012 (Figure 1). 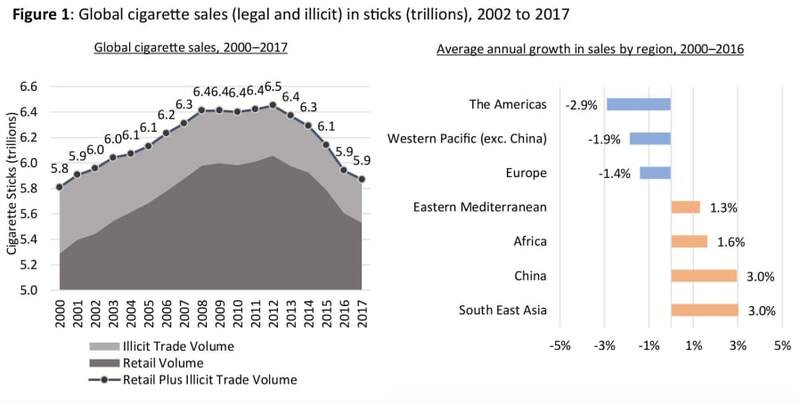 This trend was reversed shortly thereafter when global sales declined to 5.87 trillion cigarettes in 2017, below the levels seen in 2005 when the WHO Framework Convention on Tobacco Control (FCTC) entered into force. Source: Calculated from data of Euromonitor International. Over the past 50 years, as consumption has fallen in the Americas and Europe, several key trends in global tobacco production have emerged. 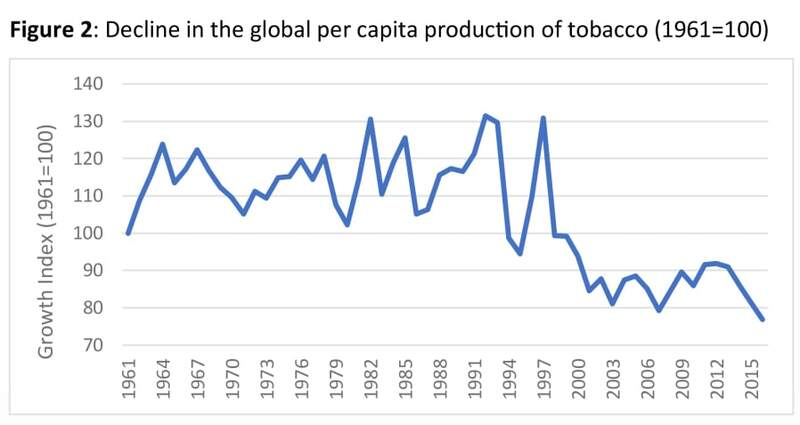 First, per capita tobacco production has declined in these two regions, dropping to about 80% of the levels seen in the 1960s (Figure 2). Second, the global share of tobacco production has declined in North America and Europe, shifting to China, Brazil, India, and some African countries, e.g., Malawi . China has remained the top producer of tobacco in the world since the 1980s. Its production levels peaked in 1997 at approximately 3.1 million metric tons, almost three times greater than those of Brazil and India combined, the world’s second and third largest producers, respectively. Source: Calculated from data of the Food and Agriculture Organization of the United Nations database. Two decades ago, a World Bank study concluded that while crop substitution is ineffective as a strategy to reduce tobacco consumption, it can be used to economically aid poor farmers if implemented with the right incentives. Crop substitution has been successful in richer countries when government subsidies were removed, but poorer developing countries face more complex difficulties. A challenge for poorer tobacco farmers is that they face fewer alternatives to the benefits offered by tobacco leaf buyers, such as obtaining credit for inputs and having an assured market (even if prices are low). Governments face challenges, too. In African countries that rely heavily on tobacco exports for foreign exchange and tax revenue, introducing alternative development strategies can be expensive. The most heavily impacted countries are Malawi, Tanzania, and Zambia where the tobacco crop ranks first, second, and third, respectively, in generating export earnings. All three countries have some of the highest poverty rates on the continent. Innovative solutions are needed to wean governments off of their dependency on tobacco revenues and facilitate investment in economic diversification. Evidence shows that viable alternatives for tobacco farmers in developing countries is possible. In Africa, for example, findings from an evaluation of a diversification program of the Kenyan government and the International Network for Bamboo and Rattan revealed that 75% of targeted households reported improved income from transitioning to economically viable enterprises in the bamboo industry. In Asia, evidence from Cambodia suggests that alternative crops can provide higher income-generating opportunities. In addition to having the right economic incentives in place, the political will to transform is important as evidenced by recent successful efforts in Ethiopia and Rwanda, where rural poverty rates have declined. Malawi is the most tobacco-dependent exporting country in the world, and its people suffer from a disproportionate burden of global poverty and food insecurity. As of 2016, the poverty head count ratio was estimated at 51.5%, and, according to the most current data from the 2015–16 Malawi Demographic and Health Survey (DHS), 37% of children under 5 have stunted growth. Clearly, tobacco production has not been beneficial. According to a 2016 study, only 25% of Malawian tobacco farmers were satisfied with the sales prices they received in 2014, and approximately 41% had considered switching to alternative crops or livelihoods. The Foundation for a Smoke-Free World is investing in people and institutions in Malawi to support development of alternative livelihoods for smallholder tobacco farmers. The Foundation will build a model of engagement there that will advance scientific and technological innovation through local policy efforts, such as the National Agricultural Investment Plan (NAIP) of the Government of Malawi. The NAIP is the result of a national stakeholder consultative process that seeks to sustainably transform the agricultural sector into a market-oriented one in order to increase productivity, incomes, and food security. The Foundation’s ATI strategy for Malawi aims to be an innovative force in transforming the lives of tobacco farmers by achieving change at several levels: enabling alternative livelihood strategies; investing in agricultural research and development and related human and institutional capacities; facilitating commercialization through new markets and sustainable business models; and strengthening policy to create an enabling environment for private-sector investments. The ATI will prioritize research, local-based initiatives, innovation, and evidence-based policy strategies that will simultaneously—and independently—support improved nutrition outcomes, recognizing that well-nourished and healthy citizens are essential to healthy economies, and vice versa. It will be considered a success only when the benefits accrue directly to the individual farmer, positively affecting individual incomes, assets and consumption, and food security. As demand for tobacco continues to decline, tobacco production alone is no longer an economically sustainable option for millions of smallholder farmers in developing countries. The Foundation for a Smoke-Free World is committed to exploring market-led and science-based solutions that will allow these farmers to transition to other crops and/or alternative economic livelihoods. About the Foundation: The Foundation is an independent, nonprofit organization dedicated to accelerating global efforts to reduce death and harm from smoking, with the goal of eliminating smoking in this generation. The Foundation has received an annual 12-year pledge of USD 80 million from Philip Morris International (PMI) that began in 2018.